Every time I restart the container while files are actively downloading it goes through and checks every one of them. Is this supposed to happen? Is there any way to disable this? The integrity of torrents requires the application to know the files haven't changed. There's no way to safely shutdown to prevent this? If I have hundreds of files running this effectively takes me offline for doing something as simple as updating the container. I'll note that binhex's ruTorrent doesn't do this step either. are it just put the option in there say port 1080 do I need to change some of the port on the docker for that don't know what the all are for . I've read the thread but coudn't find a solution to my problem, maybe you can help me. I keep getting the message "[info] Waiting for qBittorrent process to start listening on port 911..." but the webpage is never accessible. 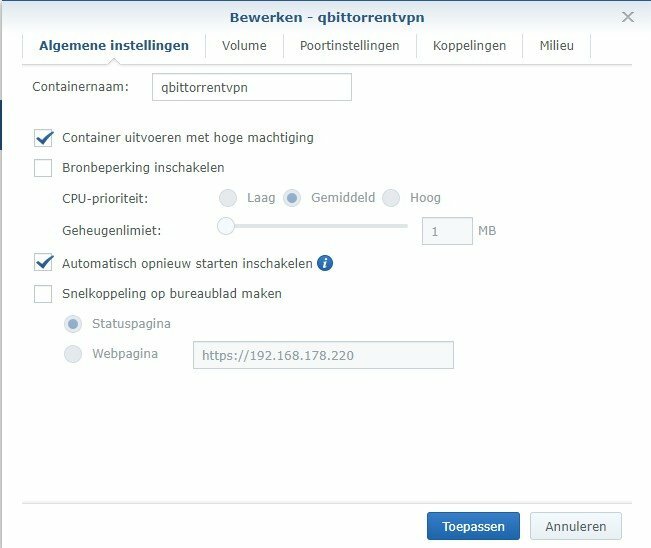 are you running the container 'privileged', if not then qbittorrent will not start. hmm ok, i would double check with synology support/forum that that checkbox really does equate to the 'privileged' flag for docker, as if its anything less than that then you will see the exact symptoms you are describing. one other thing to check, what happens if you set VPN_ENABLED to no, can you access the web ui then?. As per synology's website it is execute with high privilege, ive used that for multiple instances as well, including your (binhex) delugevpn. But pia told me to use qbittorrent instead as it would be better for speeds. Ive tried multiple changes among vpn_enabled to no but no different out ome unfortunately. delugevpn does not require privileged elevation, it is set like that for unraid users only because there is no simple way to set '--cap-add=NET_ADMIN' which is what is actually required (other than extra args which is ugly). so i know you are saying this is 'high privilege' but i have to ask, is that the same as 'docker run <rest of command> --privileged=true <rest of command>', can you actually see what synology executes as a command line?. 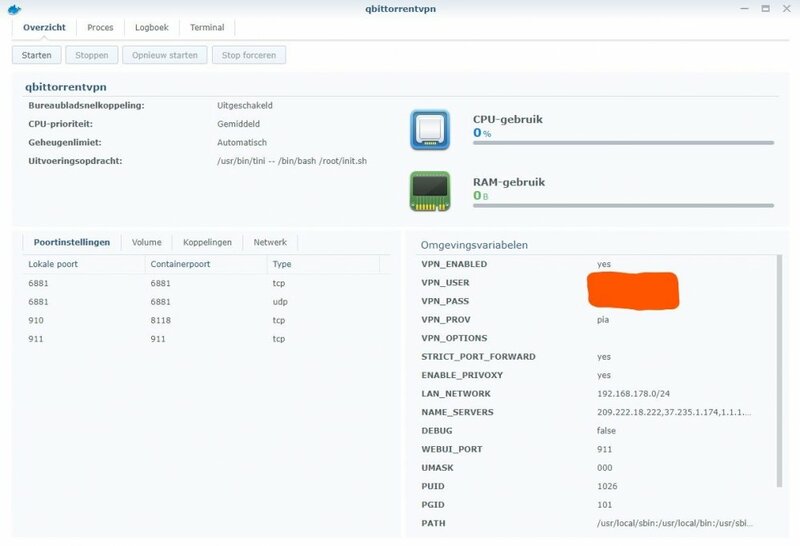 if you cant access the ui when the vpn is disabled then the issue is not related to port forwarding, openvpn config or account credentials, its got to be permissions related, thats my guess, is there nobody else you can talk to on the synology forum that has this running?, it probably would be much quicker as they know what hoops (if any) need to he jumped through in order to get this running on a synology appliance. Thanks for the help so far! I'll try to find something on the web in a few minutes and let you know! So I have got the container to run fine and everything seems to work - Privoxy, VPN and QT. Except QT won't start automatically when the container starts. If I run /usr/bin/qbittorrent-nox it starts fine - and works fine. I thought I might be able to add the application to startup, but I thought it wuld be better to try and understand why it is not running first. Could you perhaps point in to where QT should be starting up automatically so I can maybe try and work out why it is not? Secondly, I want to save torrents to a SAMBA share (an old NAS). So I want to try and install and configure cifs-utils on the container. However, if I bash into the container and run pacman to download the package (or any package) it times out - specifically on the extra package. The core installs fine, but when pacman goes to download the extra package, the speed slows right down about 40% through and I eventually get the message "Operation too slow. Less than 1 bytes/sec transferred the last 10 seconds". This even happens when I run pacman -Syy... I have made sure my Windows host firewall is off etc. The Torrents themselves download fine at a decent speed - so I assume the networking is good. I have tried changing DNS for that container and using different mirrors for pacman. Google has told me to try and use wget for pacman. But wget is not installed by default - and of course I can't download it either! So I was wondering if maybe this had to do with pacman going through the VPN or something? Has anyone else experienced this? Thanks for any advice in advance. Apologies for the newbie questions! Privoxy, VPN and QT. Except QT won't start automatically when the container starts. If I run /usr/bin/qbittorrent-nox it starts fine - and works fine. Secondly, I want to save torrents to a SAMBA share (an old NAS). So I want to try and install and configure cifs-utils on the container. obviously you then finally configure the application (in this case qbittorrent) to use /smb to read/write to - be aware writing to a remote share MAY result in yo-yo dl/ul speeds, ideally i would recommend writing only to local drives on your host. Awesome and thanks so much for replying! Your second point makes total sense. Stupid thing is I did read about that when I was doing my Docker crash course - then I completely didn't think to use it in this instance! I'm sure that will work perfectly. Re your 1st point. The strange thing is, the VPN seems to be up and running fine. If I set the browser on my host to use Privoxy and go to somewhere like "whatismyipaddress.com" I get a PIA IP address. I double-checked and confirmed that the IP tables also seem to be working as intended (ie if the VPN is down, there is no Internet access). For example, if I run a command to terminate the OpenVPN tunnel in the container (killall openvpn), I can't get out to the Internet at all (DNS doesn't resolve and pings don't work). So I'm pretty sure the VPN is AOK. Could it be that the VPN is taking too long to connect so QBT tries to start before it is established? Could it be that the VPN is taking too long to connect so QBT tries to start before it is established? nope, absolutely not, there is code in place to explicitly prevent this, otherwise you could get into a situation where you have ip leakage, so qbittorrent will not start until the tunnel is established and running. Ah ok makes sense. Can you point me possibly in the direction I should look? Where is the config to start QBT automatically? OR are there any logs? I have tried to run the container twice - (with different DNS servers just in case) and had the same situation both times. Could it be related to these errors? i cant test further as I need to head to bed so turned it off and went back to deluge. [info] Waiting for qBittorrent process to start listening on port 8080..
How do i use an ovpn config file from my VPN provider? I do not use PIA or any other that are listed and will have to use custom. Will I have to use something like this https://ronnieroller.com/unraid#setup-notes_vpn-setup? I have been using a windows machine with the VPN app but would like to move everything over to docker. Thanks. 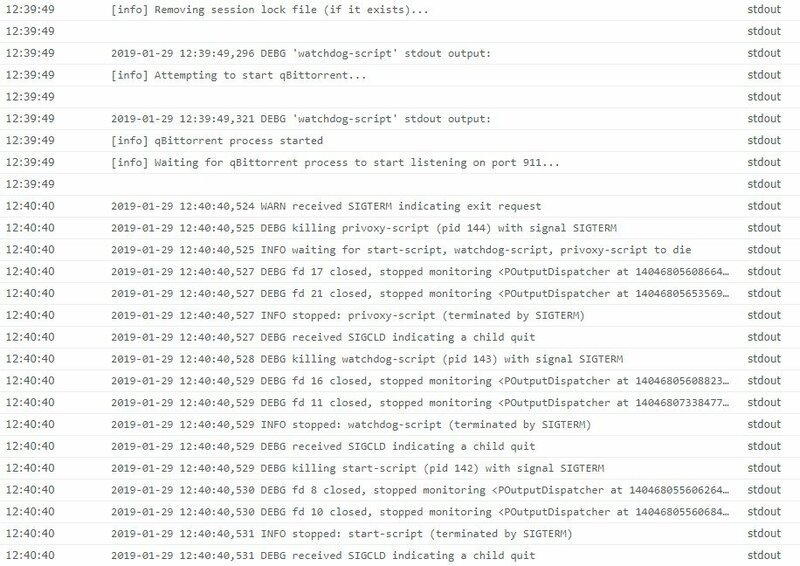 @binhexdid you get chance to look at log output I posted?